In the film's prologue, Frank Bryce (Eric Sykes), Riddle manor's elderly caretaker, investigated a light in the middle of the night that was illuminated in the nearby manor. He eavesdropped on a conversation between servant Wormtail (Timothy Spall), Lord Voldemort (Ralph Fiennes) - seated in a chair, and a third unnamed or unrecognizable individual (later revealed to be Barty Crouch, Jr. (David Tennant)). They seemed to be conspiring, plotting and scheming to capture and then murder a boy (Harry). A large snake named Nagini, a symbol of Voldemort, reported that Bryce, the old Muggle caretaker, was listening outside their door. Voldemort's killing command of "Avada Kedavra" murdered the old man. The Hogwarts Express train took the students to school, Harry's fourth year. During opening announcements at the school, Headmaster Albus Dumbledore (Michael Gambon) told everyone that Hogwarts had been selected to host the Triwizard Tournament, bringing together three schools to compete in a series of "magical contests...not for the faint-hearted." Each school would select a single student to represent them, and "eternal glory" awaited the student who won the tournament, by surviving three "extremely dangerous" tasks. At the same time, the Auror (or dark wizard catcher), Alastor "Mad-Eye" Moody (Brendan Gleason), arrived. He was the new Defense Against the Dark Arts teacher - noted for his all-seeing, moving glass eye, powerful magic skills, disregard for rules and for teaching illegal lessons in his classroom, artificial leg (and limp), and ever-present drinking flask. Dumbledore called upon the head of the Department of International Magical Cooperation, Mr. Bartemius Crouch (Roger Lloyd-Pack), to explain the rules of the tournament, causing an uproar when he said no one under the age of 17 was to be considered. The outrageously crazy Moody taught his students an illegal lesson about the three Unforgiveable Curses, including the Imperius Curse (when a victim was forced to do another's bidding), the Cruciatus Curse (aka the Torture Curse), and the third - the Killing Curse ("Avada Kedavra") - survived by only one person, Harry Potter. Underaged 14 year-old wizard Harry was unexpectedly selected as a fourth competitor (to represent Hogwarts as a second entry alongside Cedric Diggory). This immediately caused a personal rift between Harry and other students ("He's a cheat. He's not even 17 yet"), between Harry and best friend Ron, and between Dumbledore and adult representatives of the other competing schools. (Students began wearing "POTTER STINKS" badges, and Ron suspected that Harry had submitted his own name.) However, Mr. Bartemius Crouch ruled that the "suspect entrant" Potter must compete: "The Goblet of Fire constitutes a binding magical contract. Mr. Potter has no choice." Headmistress Minerva McGonagall (Maggie Smith) worried that Potter would be offered up as bait: "Potter is a boy, not a piece of meat." Harry received a reply-letter from Sirius Black, telling him: "We need to talk, Harry, face to face." They met secretly in the Gryffindor Common Room at 1:00 am Saturday night. Speaking to him from the fireplace's burning embers, Sirius asked Harry about his earlier dream with Wormtail and Voldemort and the identity of the third man in the room. Harry only knew the man's task was ordered by Voldemort - to kill Harry. Black warned that the Quidditch incident and the Goblet choice were not just coincidences: "Hogwarts isn't safe anymore...The devils are inside the walls." It was possible that either former Death Eater Igor Karkaroff (Predrag Bjelac), the headmaster of Durmstrang Institute, or Mr. Barty Crouch, who sent his own son Barty Crouch, Jr. to Azkaban, put Harry's name in the Goblet - to kill him: "People die in this tournament." Many of Harry's classmates thought badly of Harry's inclusion in the tournament, including "pathetic" Draco Malfoy (Tom Felton), who bet that Harry wouldn't last five minutes. During the tournament after the completion of the first task, a Yule Ball dance was held in the Great Hall on Christmas Eve night. The heroes all scrambled for dates, and as it turned out, Harry was accompanied by Parvati Patil (Shefali Chowdhury) (although his first choice was Cho Chang (Katie Leung)), Ron was with her twin sister Padma (Afshan Azad), Cedric with Cho Chang, and Neville Longbottom (Matthew Lewis) with Ginny Weasley. Hermione, looking very grown-up and lady-like, appeared with popular and athletic Bulgarian-Durmstrang competitor Viktor Krum, causing a slight fall-out between the trio of friends, especially due to Ron's jealousy. After the completion of the second task, Mr. Barty Crouch briefly spoke to Harry about his victory, mumbling something about Harry's "tragic" story of losing his family: "Never whole again, are we? Still, life goes on..." Soon after, he was found dead in the forest, and there was debate about whether to continue with the tournament. While waiting in Dumbledore's office, Harry curiously looked into the Headmaster's Pensieve (a memory depository or storage area), and was transported back in time to witness one of Dumbledore's memories. He sat in a Wizard Council (Wizengamot) court trial, in which accused Azkaban prison convict, Death Eater Igor Karkaroff, presented names of other Death Eaters, including Severus Snape (whom Dumbledore claimed was cleared of charges since he was acting as a spy to bring down Voldemort), and Barty Crouch, Jr, who used the Cruciatus Curse and captured-tortured the Auror Frank Longbottom and his wife (Neville's parents). After the startling revelation, Barty's father denounced his son ("You are no son of mine") and wished for him to be imprisoned in Azkaban. Once he returned to his office, Dumbledore told Harry that there might be a small detail or clue within his memories, to explain why terrible things were happening recently at Hogwarts. Harry then told Dumbledore about his nightmare from the previous summer, and how he now recognized that Mr. Crouch's son was the third individual. As Harry returned to his room, he found Karkaroff speaking to Professor Severus Snape in his store, talking about a "sign" that they both knew the meaning of. Suspicious of Harry, Snape then accused him of stealing Veritaserum, a truth serum, an ingredient for the brewing of Polyjuice Potion, used for impersonating the appearance of someone else. In the competition's third and last task, the four competitors were positioned inside a tall hedge maze, where the goal was to reach the TriWizard cup first. Before the start, Dumbledore cautioned the four about the maze's formidable challenge: "People change in the maze...You could just lose yourselves along the way." As the two champions Harry and Cedric touched the cup together, they were simultaneously transported to a graveyard - since the cup was a Portkey. Harry realized he had visited the cemetery before, in a dream, as he stood before the gravestone of the Riddle family. As Harry screamed for Cedric to get back to the cup, they saw Wormtail/Peter Pettigrew carrying a deformed infant (Lord Voldemort). The creature ordered: "Kill the spare" -- Wormtail used the Killing Curse ("Avada Kedavra"), the third Unforgiveable Curse, to kill Cedric. After trapping Harry within the Riddle tombstone, the infant was dumped into a boiling cauldron, and Wormtail uttered an elaborate spell and potions mix of three ingredients (including "bone of the father unwillingly given" - a bone from the Riddle grave, "flesh of the servant willingly sacrificed" - his own amputated hand, and "blood from the enemy" - blood extracted from Harry's arm) to regenerate Voldemort into body form: "The Dark Lord shall rise again." Voldemort then summoned his "friends," the Death Eaters, and reminded them it had been 13 years since his last appearance. One of the Death Eaters who loyally vowed never to renounce the old ways was evil Lucius Malfoy (Jason Isaacs), student Draco's father. Voldemort then confronted his long-time famous nemesis Harry Potter, "the boy who lived," and Voldemort spoke of the legend of Harry's parents' death that occurred thirteen years earlier, when he truly lost his powers, due to the protective sacrifice of Harry's mother Lily (his "filthy Muggle mother"). Voldemort challenged Harry to a duel of wills and wands, and threatened death: "I'm going to kill you, Harry Potter...After tonight, no one will ever again question my powers...I want to see the light leave your eyes." The forces from their respective wands simultaneously met each other when they both commanded spells at the same time: "Expelliarmus" and "Avada Kedavra" - causing a Priori Incantatem connection between them that called up the reappearance of the protective spirits of Voldemort's recent victims, including Cedric and Harry's own parents. Harry heard them say to let go and return to the Portkey - the TriWizard cup. He obeyed, escaped Voldemort's presence, and was immediately transported by the Portkey back to the school, along with Cedric's body. His return as winner of the third test was applauded and congratulated but at first misunderstood, until he told Dumbledore about Voldemort's return ("He's back. He's back") and his responsibility for the death of Cedric. Harry was rushed back to Alastor Moody's office in Hogwarts Castle, where he became suspicious when his Professor began asking questions about being in the presence of the Dark Lord, and about the 'graveyard' - something Harry hadn't mentioned. Moody also became frantic after his supply of flask drink ran dry. Moody admitted how he had facilitated Harry to be in the competition, and had helped him win ("You won because I made it so, Potter"): Hagrid with knowledge of dragons in the woods, Cedric with knowledge about opening the egg underwater, and Neville with knowledge of gillyweed. Harry suddenly realized Moody had put his name in the Goblet of Fire, had bewitched Krum in the maze, and had arranged for him to be in the graveyard to give his blood to rejuvenate and revive Voldemort: "The blood that runs through these veins runs within the Dark Lord." Dumbledore arrived and prevented Moody from silencing Potter forever. Snape forcibly administered a dose of Veritaserum, so that Moody would honestly answer their questions. It was revealed that Professor Alastor "Mad-Eye" Moody was an imposter - he was transformed into Barty Crouch, Jr. (who had been sentenced to Azkaban by his father but then escaped) before their eyes. All along, Crouch, Jr. had been drinking Polyjuice Potion from his flask, stolen from Snape's store, to create the impersonation so that he could function as Voldemort's servant. The real Alastor Moody was trapped in a multi-tiered magical trunk and released, and Barty Crouch, Jr. was sent back to Azkaban. The film concluded with Dumbledore openly explaining to the students (Hogwarts, Durmstrang, and Beauxbatons) the truth of what had occurred: the murder of Cedric by Lord Voldemort, and the return of the Dark Lord. He reminded them that they were united: "Our hearts beat as one" and their bonds of friendship would continue, so that Diggory's death would not be in vain. Privately, Dumbledore told Harry: "Dark and difficult times lie ahead. Soon we must all face the choice between what is right and what is easy." He strengthened Harry's resolve: "You have friends here. You're not alone." The members of the other two schools departed as the school year ended. Hermione was hopeful as she told her two friends: "Everything's going to change now, isn't it?" Harry reassured her that he would write to her every week, as they left for the summer. Nominated for one Academy Award (with no win): Best Art Direction. With a production budget of $150 million, and gross revenue of $290 million (domestic) and almost $896 million (worldwide). 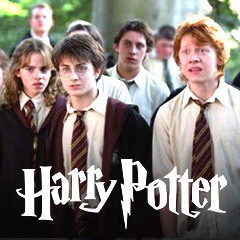 This was the first PG-13 rated Harry Potter film. Key Scene: Evidence that the trio of friends was physically maturing surfaced in the lead-up to the Yule Ball held in the Great Hall on Christmas Eve night. The heroes all scrambled for dates, and as it turned out, the most astonishing date-pairing of the night belonged to Hermione, looking for once very grown-up and lady-like. She appeared with popular and athletic Bulgarian-Durmstrang competitor Viktor Krum, causing a slight fall-out between the trio especially due to Ron's jealousy.